Gearing is the simplest and cheapest tuning trick on the planet. MXA always talks about gearing a bike up or gearing it down. Then sometimes you guys say that this gear ratio is 3.77 and the other sprocket is a 3.65. What does all that really mean? It is a simple math equation. There are two sprockets on every bike: (1) The smaller countershaft sprocket is attached to the engine. (2) The larger rear sprocket is attached to the rear wheel. The two sprockets are measured by their number of teeth. As a quick rule of thumb, the more teeth on the rear sprocket, the lower the gearing. Conversely, the fewer teeth on the countershaft sprocket, the lower the gearing. Once you know the number of teeth on your bike’s countershaft sprocket and rear sprocket, you can determine a reference number—called a “gear ratio”—that tells you exactly what is happening to your motorcycle’s driveline. You get the gear ratio by dividing the number of teeth on the rear sprocket by the number of teeth on the countershaft sprocket. For example, a 13-tooth countershaft sprocket will divide into a 49-tooth rear sprocket 3.77 times. This gearing combination is said to have a 3.77 gear ratio, because that is how many times the countershaft sprocket turns before the rear wheel makes one full revolution. The higher the gear ratio number, the lower the gearing. Thus, the 3.77 of a 13/49-tooth combo becomes a 4.00 if you add three teeth to the rear sprocket (13/52). Every time the gear ratio number goes up, you lessen top speed but increase acceleration. Conversely, if you want to mellow the engine’s hit and increase the speed in each gear, you should seek a smaller gear ratio number. For example, using our stock 13/49 as a starting point at 3.77, a 13/46 combo would produce a 3.54 gear ratio. When thinking about your bike’s gearing, the goal is to maximize performance for your riding style, skill level and track conditions. For example, a 14/52 gearing combo has a 3.71 gear ratio. But, if the bike’s owner wanted lower gearing, he would most likely add one more tooth to the rear sprocket. This 14/53 combo would lower the gear ratio to 3.79 (compared to the stock 3.71). But, if the rider wanted the gearing to be lower than that, he would be in a conundrum. 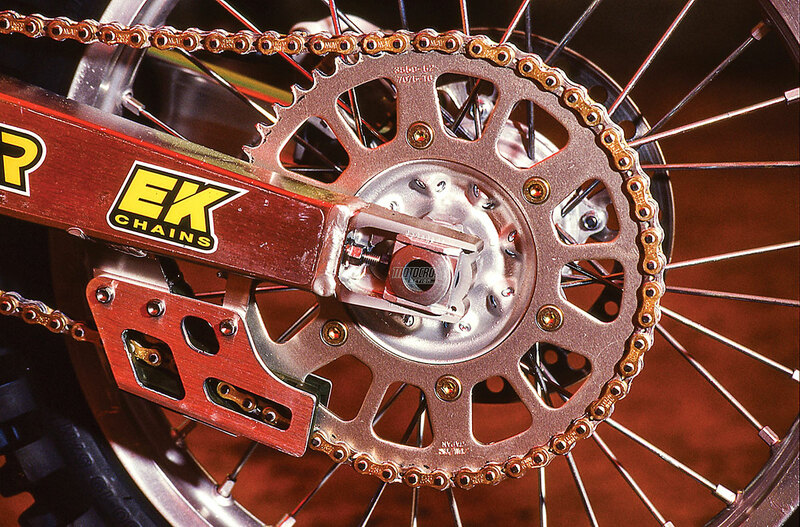 Switching to the logical 54-tooth rear sprocket would give him a lower 3.86 gear ratio, but the large 54-tooth rear sprocket would have trouble clearing the chain guide and put excessive wear on the chain itself. In this case, the better solution would be to switch to a 13-tooth countershaft sprocket and mate it to a 50-tooth rear sprocket. This 13/50 gearing would be lower than either 14/52 (3.71) or 14/53 (3.79) at a 3.85 gear ratio. Most MXA test riders try to gear their bikes so that they can use third gear on the bike more, especially if the power lags on the shift from second to third gear. Choosing the proper gear ratio is a cheap way to make your bike perform better by making it feel more powerful (by gearing it down) or more manageable (by gearing it up). 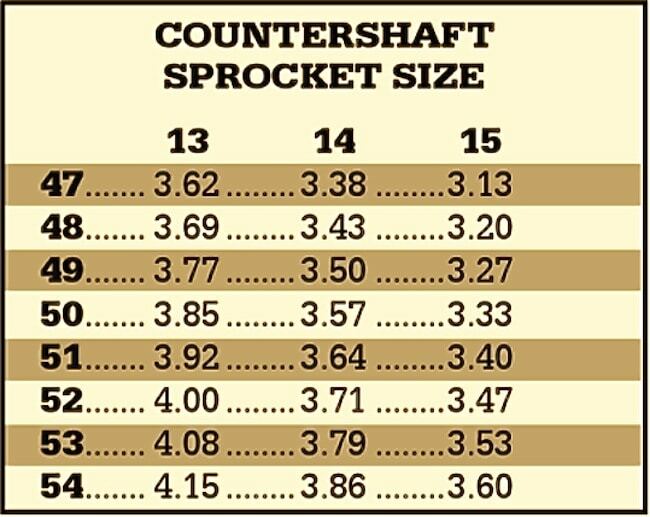 The chart below gives you the gear ratios for the most common sprocket combinations.